Adam, one of my long time readers just sent me a link to a tiny house he built with his brother. The home’s design was inspired by a few of the free tiny house plans I offer here. Their adaptation of the plans really turned out a great design. I really love the use of materials, various exterior finishes, and attention to detail. This past winter, my brother and I decided to try our hands at a tiny house build. With my skills as a builder and my brother’s as an artist and designer, we set out with a rough design and many things to learn. We began with a modified plan that was inspired by two of Michael Janzen’s solar house plans from tinyhousedesign.com. The final product is the beaming rustic modern tiny house you see above. Our spacious tiny house began as a 20′ trailer with dual #3500 axles that transported a lowly camper in days bygone. Painted and leveled, construction was ready to begin. The now completed rustic modern home is 21′ long, cantilevered a foot off the back, and semi-divided into three seven-foot sections. The square footage is approximately 130 sq ft, not including the additional sleeping loft. It has a maxed out 8′ 6″ width and towering 13′ 3″ height, with a folding deck and removable awning for travel. While the weight is yet to be determined, it is estimated at 5500 – 6000 pounds. The front and rear sections of the house are constructed with 2×4 floor framing. The center section raises above the wheels with 2×10’s. Sheathed underneath with 1/2″ painted plywood and topped with 3/4″ subfloor the floor is covered with 3/4″ stained pine flooring. The majority of the exterior is 1×4 cedar rain-screen siding, with a ply-and-batten backside and painted pine left frontside. Nine Crestline double-paned windows fill the walls and a Crestline low-e swinging patio door transitions the space from inside to out. On top of it all is an exposed fastener steel roof. Inside, the ceiling is 12″ maple plywood with a narrow reveal. Walls throughout the house are painted hardboard. Corrugated galvanized steel surrounds the shower, toilet, and closet in the bathroom. Five-inch-wide pine tongue-and-grove covers the floor, stained and sealed with Danish oil. The cabinets and countertops are custom-made from 3/4″ maple plywood. The cabinets and ceiling are sealed with linseed oil and the counter has a clear gloss epoxy coating. The loft, covered in the same pine flooring, is large enough to fit a low-profile queen mattress or pad. A small open storage area is accessible from the kitchen, with additional closet space in the bathroom. The house is plumbed and wired, similar to the common camper. A water hook-up is underneath, supplying water to the sink, shower, and 6-gallon Bosch electric water heater. Power comes through a 30 amp camper hookup. Inside, there is a 4-circuit sub panel with two 15-amp and two 20-amp circuits. Originally designed to be heated by a small electric space heater, it was later decided that heating is a personal preference. Knowing that some would prefer propane or wood heat, these can be easily incorporated. While it does not currently contain a heater, one can be installed one or you may supply your own. The bathroom houses a sawdust compost toilet, but is able to be converted to an RV toilet if you have a full-time sewer hook-up. The living room has a ceiling fan for circulation and the windows provide excellent cross-ventilation as well as ample solar heat on a cold sunny day. A window air conditioner could also be easily added in the summer months. The house comes furnished with an IKEA sleeper loveseat and IKEA banana leaf rocking chair. The refrigerator is an Igloo two-door fridge and freezer. The kitchen’s propane stove is upcycled from the original camper. The entryway prides itself in its custom-built pine storage cubby and two IKEA chairs, able to be pulled up to the multi-purpose counter. All furniture is included in the price and decorative items may be purchased at an additional charge. 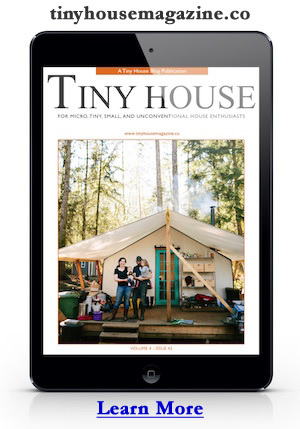 With my brother and I both being a towering 6′ 7″, Tall Man’s Tiny House was born. Everything was built with those who are vertically blessed in mind. The low points on the main floor are the standard door and entryway ceiling at 6′ 8″. Both of us are able to crawl into the spacious three-and-a-half tall loft. This house was built as if it were being building it for ourselves, no detail left undone. The asking price is $27,000 with buyer arranging transportation. Visit their website, Tall Man’s Tiny House, for more photos, information, and contact information. The house is currently located in the Columbus Ohio area. This entry was posted in Uncategorized and tagged Adam, for sale, modern, tall man, tiny house. OMG! It looks amazing and it shows excellent workmanship. I love it! Thanks for sharing. The craftsmanship of this tiny house is incredible. I love it. Beautiful home, sad to see it has been sold! I wish the guys would consider building more, the price was incredible for such excellent craftsmanship. But I would easily pay more for such a great design.